HOUSTON (AP) In a game that he dominated offensively, Memphis Grizzlies center Marc Gasol said it was the team’s defense that helped the most in the wild come-from-behind win over the Houston Rockets. Gasol scored 26 points to lead the Grizzles to a 98-90 win in Houston on Monday night. Memphis has won its first three games for the first time since the 2014-15 season when the team won its opening six contests. Memphis allowed just two points in the final six minutes and ended the game on a 20-2 run. With the game tied at 88 with less than three minutes remaining, tempers flared after Memphis guard Mario Chalmers fell to the ground and tripped James Harden, who then shoved Chalmers as he tried to get off the ground. After a lengthy review, both players received technical and Harden was called with an offensive foul. Memphis guard Mike Conley said Chalmers’ scrappiness provided a spark for the Grizzlies. On the following play, James Ennis III made a shot where he was fouled and converted the free throw to put Memphis up three. After Clint Capela’s dunk, Conley hit a 3 to push the lead to 94-90. Conley struggled for most of the game, shooting 3-for-10 from the field and scoring nine of his 17 points at the free throw line, where he was perfect. 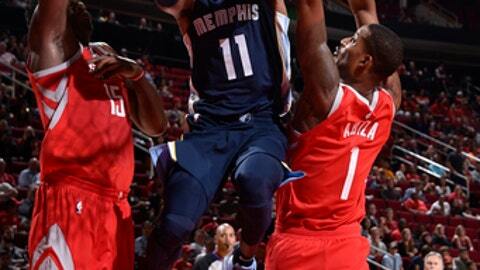 But he came on huge for Memphis down the stretch, making key shots and getting pivotal assists. For most of the game, it was Gasol who gave Houston fits. Whether he was overpowering Capela or shooting over smaller forwards, Gasol found a rhythm, making eight of his 15 shots and going 10-for-10 from the free throw line. On Eric Gordon Bobblehead Night where he was presented with his Sixth Man of the Year Award in a pregame ceremony, the veteran guard was ironically a starter in the game. Gordon led the Rockets with 27 points. Harden finished with 22 points, eight assists and five rebounds. Houston was held to 90 points, three less than their season low of 93 from all of last season. Houston led 57-50 at halftime. The Rockets held a lead as big as 12 points in the second half, but the Grizzlies got hot midway through the fourth quarter. The Rockets made just nine 3s on 23.7 percent shooting. Houston was 1-8 when making less than 10 3s last season. Forward Chandler Parsons was booed heavily by the Toyota Center crowd when he first took the floor. Parsons spent his first three seasons in Houston before leaving for Dallas in 2014. Grizzles: Guard Tyreke Evans played through a bruised left knee after being listed as questionable. Evans played 21 minutes and had five points. … Forward JaMychal Green missed a second straight game with a left ankle injury and wore a boot on the team’s bench. Rockets: Harden was named Western Conference Player of the Week early Monday after averaging 27.7 points, 9.0 assists, 4.0 rebounds and 1.67 steals to lead Houston to a 3-0 start. It was the 14th time in his career to win the award. … Veteran center Nene received a technical foul for a dead-ball brush with Parsons late in the third quarter. Grizzlies: Visit Dallas on Wednesday night. Rockets: Visit Philadelphia on Wednesday night.